When next in the Caribbean, be adventurous and try breadfruit – you won’t be disappointed by its delicious taste! 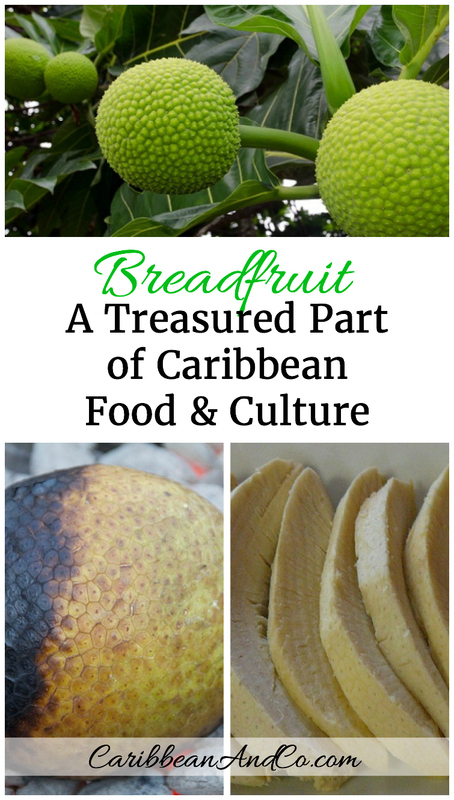 Breadfruit is eaten across the Caribbean due to its versatility and ability to grow in almost any soil condition. The tall evergreen tree produces a hearty bounty two to three times a year and requires so little care that new trees will often spring up from seeds that have fallen on the ground. Even without any human intervention, these will likely mature on their own into fully grown breadfruit trees. Breadfruit trees have even been known to regrow from stumps left after the original tree was cut down. Breadfruit is a high yielding plant, and a mature tree can produce up to 200 pounds of breadfruit at a time. The green-skinned fruit weighs anywhere from 2-6 pounds and can grow as big as a soccer ball, yielding enough food for a family of four. Breadfruit can be harvested at different stages during growth depending on how it will be prepared. The immature fruit is preferred for boiling when it has the taste and consistency of a cross between an Irish and sweet potato. When baked or roasted, breadfruit has a dry texture resembling bread. This recipe utilizes the fully matured fruit, which is picked and set aside for a few hours to a day to allow the white sticky liquid to drain from its center. Breadfruit takes about an hour to cook and is often served with meat or fish. One of the more popular ways to cook breadfruit in the Caribbean is to roast over an open fire. Photo credit: ©Ursula Barzey. 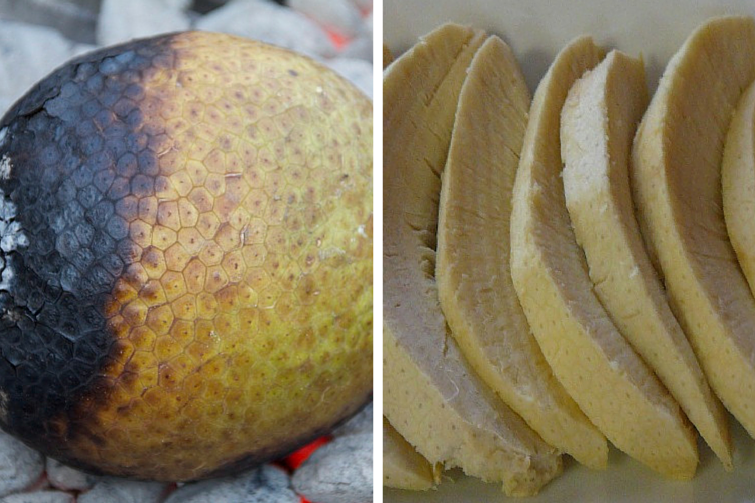 Some people prefer to cook breadfruit in a semi-ripe state when it develops a slightly sweet taste similar to ripe plantains. Breadfruit can also be fried in slices or chips, or to make pancakes or salad. The ripe breadfruit has even been used to make a drink. As for its nutritional content, breadfruit is low in saturated fat and has plenty of fiber, carbohydrates and vitamin C.
Breadfruit trees are believed to have originated in New Guinea, and grew abundantly in the Pacific islands where it was prized for its high yielding produce. In the high flying days of the sugar plantation era, European plantation owners needed a sustainable food source for their African slaves but did not want to use sugar lands to grow food. British Captain William Bligh was given the task to travel to Tahiti and bring back breadfruit seedlings to plant in the islands of St. Vincent and Jamaica. Upon arriving in Tahiti, Captain Bligh and his 45 man crew collected and prepared approximately 1,000 breadfruit plants over a 5 month period allowing the plants to mature to a level best suited to survive the journey back to the Caribbean. This unplanned extended stay allowed some of the crewmen to form relations with local women that made it difficult to leave. Due in part to these misses relations and bad conditions aboard the ship, there was a mutiny 23 days after setting sail. Captain Bligh along with 18 loyal crew members were cast adrift. Miraculously they were still able to navigate back to Britain and were sent on a second expedition. This time around they left with 2,126 breadfruit plants with approximately 678 breadfruit plants surviving. The plant thrived in Jamaica, though it took some time before locals would grow accustomed to the taste. Today, breadfruit has become a treasured part of Caribbean food and culture and is a favorite staple in the diet of many people. No longer seen as food for the poorer classes, Breadfruit has made its way into many Caribbean recipes from homes to restaurants to hotels. Breadfruit has also attracted international attention as a plant that has the capacity to provide food in poverty-stricken countries. Though the tree bears mainly in the summer months, if the soil and weather conditions are right, it will bear in abundance several times a year and possibly bring a sustainable food source beyond the Caribbean to many people all over the world.